The ultimate goal of cow comfort is to provide adequate resources to every cow in a herd. Facilities with poor cow comfort limit access to resources which in turn increases competition and social confrontation between animals. In overcrowded facilities this is noticeable at the feed bunk following milking or fresh feed delivery, as dominant cows will demand priority in feeding. In this scenario timid cows or inexperienced heifers will be limited in their access to the feed bunk, forcing them to eat less or wait until there is less competition. Eventually submissive cows will show a reduced willingness to compete for resources, which negatively affects milk production. Aside from access to feed, one resource that is often overlooked is rest or lying time. To maximize production, dairy cows require at least 12 hours of lying time each day. Lying time is associated with increased rumination, improving nutrient absorption and production of saliva. This reduces sub-acute rumen acidosis as saliva contains sodium bicarbonate, a buffer that helps stabilize rumen pH. Moreover, lying time improves blood flow to the mammary gland, which is associated with increased milk production and improved mammary function. 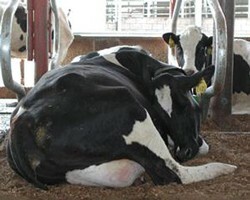 Three main factors that influence lying time are stall design, lameness, and bedding. Stalls should allow a cow to exhibit natural behaviors without injury, pain, or fear. Stalls should be sized based on the stature of the animals being housed and provide adequate resting area with unobstructed lunge space. Generally, stall length should be between 98 - 110 inches. Stall width should be a minimum of 47 inches, except in stalls used exclusively by heifers, and neck rails should be located 37 - 43 inches above stall level and 67 inches forward of the curb. If less than 98% of cows are using stalls, the reason for stall refusal should be investigated. Often, stall refusal is caused by improper neck rail placement limiting lunge or resting space. A lame cow will access resources less often, decreasing milk output. Interestingly, lameness is associated with decreased lying times due to the pain associated with rising or lying down. Prolonged standing time increases pressure inside the claw capsule reducing blood flow to the hoof. This results in inadequate oxygenation and delivery of nutrients to the horn producing tissues, perpetuating the cycle of lameness. As a result it is important to minimize forced standing time (such as time waiting to be milked) to less than 3 hours each day, a take a proactive approach to hoof health. Cows demonstrate increased lying times on stalls with cushion in comparison to hard surface stalls. Common options for stall cushioning are either mattresses or sand. Mattresses are straightforward to install and provide ease of maintenance for both workers and machines. However, mattresses require some form of litter to absorb moisture. In addition, research has shown that most mattresses lose cushioning within 1 year of purchase and require 7.5 kg of bedding per stall to improve lying times, which in many cases is cost prohibitive. Currently sand is the "Gold Standard" of bedding, mainly due to its ability to provide cushion, increase lying times, improve hygiene scores, and reduce SCC. Sand bedded facilities have also been shown to reduce lameness and maintain adequate lying times in lame cows. It is currently thought that the additional cushion and traction provided by sand facilitates rising and lying in lame cows. Overall, enhancing cow comfort can be both rewarding and profitable, as cows housed in a comfortable environment produce more milk and generally have a longer productive life.